Halloween, also known as All Hallows Eve, is a day where the fabric between our world and the next is blurred. As little demons and witches are free to wander, creating original Halloween costumes is where a lot of the anticipated fun comes in to play. 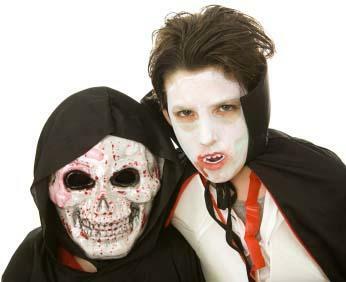 Many trick or treaters enjoy getting dressed up and asking for a Kit Kat or a Hershey bar. It is easy to get out to the local super Wal-Mart and buy a costume off the rack. Many of the costumes on the market are based on whatever is popular right now. In the 80's you would see He-Man, Spider-Man and the Incredible Hulk running down the street. The old favorite of Casper would always make an appearance, and on the scarier front a Michael Myers or Freddy Krueger. The costumes of today can still include the happy ghost, the knife-fingered dream killer and the other slasher flick staples. Hannah Montana, Britney Spears along with Bob the Builder and Elmo will be there too. The "Disney Princess" will always be on the list of all parents who have little girls. There is nothing wrong with mainstream costumes but there are going to be other kids and adults with the same outfit as you walking on the street with a hollow plastic pumpkin. Standing out from the crowd can net you some extra sweets or that all important win at the costume contest. Baseball player: There are always some sort of baseball player costumes at the mall so consider going a little old school by changing it up by adding gray cake makeup, monotone pants and top, black belt and a moustache. Now you are a baseball player from the 1920's. Cheerleader: How popular are cheerleaders? Instead of being just a cheerleader why not become the cheerleader to save the world from the show Heroes? Red and white cheerleader outfit meets broken bone prosthetics, scratches, bruises, blood and a blonde wig. Britney Spears/Hannah Montana: This is for the adults out there. Just imagine how Miley Cyrus would act if she followed Britney's example and roll with it. Being truly original with your Halloween costume ideas is the best way to experience this day of fun and great tricks. When you are going about putting together your outfit consider your personality in the process. What are your likes and dislikes? Do you secretly love the undead zombie horde? Do you really hate the dullness of the 9 to 5 nightmare known as the Office? Roll with that. Is there someone that you really admire or someone you really despise? Use that to fuel your creative juices to come up with some great costume ideas. TV dinner: Wrap yourself in tin foil being careful not put any near your joint (this avoids tearing of foil). Go to the local gift shop, Party City or Halloween store and look for pieces of meat, either loose or in packages, used as props. Do the same with fake vegetables and pin them to yourself. Household mop: It may be difficult to walk but go to the Dollar Store and buy some cheap plastic table clothes. You can either wrap yourself in them or tape or glue them to old clothing. Also buy a cheap mop that uses the dreadlock style mop head and remove it. Get a stocking and glue the mop head to it, cutting off the leg portion of the stocking. You can now wear it as a wig. Alfred Hitchcock'sThe Birds: A fine black suit and a whole lot of fake birds glued to it. Add a skullcap and a pipe to finish off the look. Day After Tomorrow: Very simple idea is to take a very large calendar and circle - you guessed it - the day after tomorrow. This is a very subtle costume and a little silly but it also is cheap. Brad Pitt and Angeline Jolie: Take a look at some recent photos. It's not hard to match their looks, just shop at Abercrombie and Fitch. The hair is fairly easy as well. Cutesy it up by heading off to the Goodwill or other secondhand store and pick up several cheap strollers - exaggerate and get 10 or so. Use duct tape and combine them all together then add a few baby dolls. Tom Cruise and Katie Holmes: Carrying a couch around with you may be a bit difficult. If your partner is taller than you then carry around a small crate to stand on so you can be about the same height. Their looks are relatively easy to copy as well, so go with it. Add a controversial touch to it by using shackles on your Katie.